Often I’m asked, “How do people have such great gardens? I can NEVER do that.” Well, yes you can! All it takes is patience, a plan, personality, and passion. Oh, and lots of blisters. Now, this is not to say that I had a plan! When I started, the only thing I knew for sure was that I wanted a crape myrtle that we could see from the den window. I’m kneeling here, since I set my camera on a tripod for a self-picture, and I’m much taller than the little tree. I snagged some free rocks to encircle my first little garden. Clueless about plants, I bought a bag of dahlia corms. I was mighty proud of this, let me tell you! This was before nurseries promoted native and hardy adapteds. Quickly I figured out that dahlias are not Texas plants. And believe me, I’m still learning what actually works for me. But with more patience then pennies, my den view is a lot more dramatic these days. But I’m not finished! As I’ve mentioned before, last spring we decided to put in a path to replace dead grass. Over the summer, I thought about what I wanted to do about the section near the island bed. Eventually, I ordered more stones and roughly painted in the plan to complete the lawn-free picture. In our original work, I planted a few frogfruit plants (Phyla nodiflora) in one section to soften and cool the stones. Butterflies, bees and other beneficials flock to them constantly. They’ve done so well that I’ve added some to the new stones (and more, as soon as I can lay my hands on this tough native groundcover). The first ones have been so prolific that I’m also dividing some to fill in the gaps. Their long stems root easily, so I just cut a section from the mother plant and dig up the rooted plant. By next spring, this picture will have changed again when it fills in! During Christmas, I’ll work on the edging. I haven’t decided whether to build up the original edging with roadbase or to use leftovers of the 6′ x 6′ dry stack stones for the vegetable bed (more on that in a few weeks). Sometimes, patience pays off to give you the answer! To spare you my early mistakes, this week on CTG, designer and garden coach, Diana Kirby, presents Design 101. Tom was booked as director of iACT (Interfaith Action of Central Texas), so I stepped in. Yowsers! Diana points out the essentials for planting: size, sun, soil, and compatible conditions. Then she recommends looking at the long-term picture: how do you want to use the space? What’s your style? She explains how to use color and texture. Diana stresses the importance of including destinations for your eye and to reinforce your own sense of style. Find out more about Diana’s designs, her garden coaching and to follow her beautiful, instructive blog! Another question CTG often gets: what is the difference between soil, compost, and mulch? I remember when I was confused about mulch and compost, too (and thought I could just stick a plant into my heavy clay soil and be done with it. Oh brother!). So, this week, Daphne explains the difference and how they work together for a healthy garden. Now, to show you that I wasn’t totally clueless in my first garden: I gathered what few leaves I had and scavenged more to scrunch into my beds, back in the days when buying even a bag of mulch at the grocery store was a financial luxury. Eventually, I made my own compost in a bin from wooden pallets left over from KLRU deliveries. These days, I just have piles behind the shed, but I also buy bags and sometimes yards. And I often add decomposed granite or expanded shale to up the drainage even more. Cover crops for vegetable beds fascinated me from the first. This week, John Dromgoole explains how Austrian winter peas, hairy vetch, crimson clover and elbon rye return nitrogen and compost to fallow winter beds destined for summer crops. While they’re growing, they’re a natural “mulch” too! 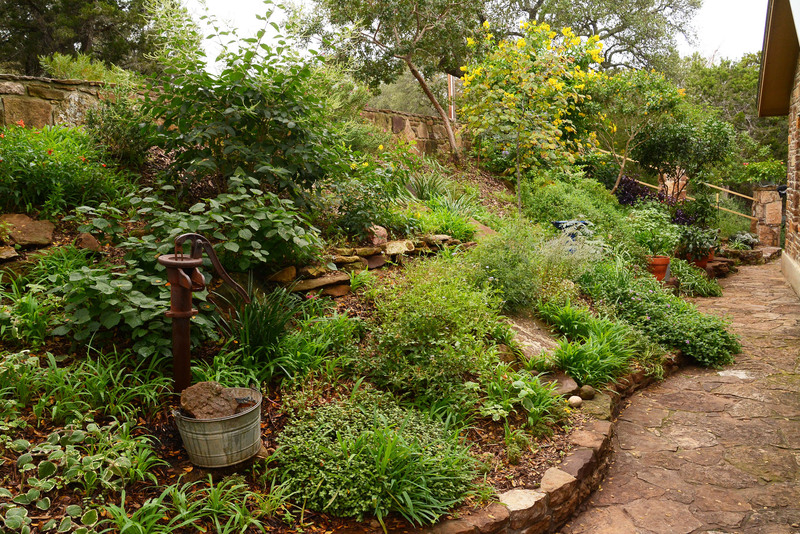 On tour, visit Molly O’Halloran and David Brearley’s first garden, where they renovated their 1915 house and garden on Austin’s east side from devastation to drought-tough style, vegetables, and safe harbor for chickens that supply organic eggs for Molly’s yummy recipes! I’m still figuring out gardening, but CTG is here to help us!